He lab member: Ling Wan (Eric), Sam Smith, Ninotchka Valdez, Yongqun He (Oliver), Edison Ong, Kallan Roan, and Meng Liu (Mia). Note: Picture taken in a conference located at Room 3753, Medical Science II (MS II), the UM Medical School, Ann Arbor, MI, on December 14 (Friday), 2018. Some lab members are not in the picture. More Hegroup Photos: 2018, 2017, 2016, 2015; 2014; 2013; before 2012. Edison Ong: MS/PhD Bioinformatics student in UM. Initially performed MS rotation research in He lab in Fall 2014, and transferred to become a PhD student starting January 2016. Edison passed his PhD preliminary exam in September 2016. Meng Liu (Mia): PhD Bioinformatics student from Shanghai Jiaotong University. Mia is a PhD exchange student who will perform her research in UM for one year (started from 9/29/2018). Hsin-Hui Huang: PhD student (major: Biotechnology and Laboratory Science in Medicine), School of Biomedical Science and Engineering, National Yang-Ming University (YMU), Taipei, Taiwan. Hsin-Hui is a PhD exchange student and will do her research in UM for one year (started from 5/1/2019). Ling Wan (Eric): Visiting scholar. Dr. Wan from Jiangsu, China will perform biomedical ontology research for one year starting from August 7, 2018. Kaiyong Liu: Visiting scholar. Dr. Liu is an associate professor from Department of Nutrition and Food Hygiene, School of Public Health, Anhui Medical University, Hefei, Anhui, China. He will stay for one year starting from March 11, 2018. Sam Smith: A retired engineer from Detroit. Sam and Oliver collaborated on ontology-related projects. Mei U Wong: Research volunteer. Mei earned her B.S. in Biomchemistry and Cell Biology from University of California, San Diego. Yongqun "Oliver" He (何勇群; PI), Associate Professor of Laboratory Animal Medicine, Microbiology & Immunology, and Bioinformatics, University of Michigan Medical School. Sirarat Sarntivijai, PhD student in Bioinformatics (10/2009 – 5/2012) (Note: May 2012 - Nov 2014: ORISE postdoctoral fellow at FDA; starting Dec 2014: an EBI bioinformatiican - Ontologist). Oliver He is Sira's PhD thesis co-mentor. Denise Bronner, PhD student in Microbiology and Immunology: Research rotation in He lab: Fall 2010; Joined He lab Summer 2011-April 2012 to conduct Brucella-host interaction research; and then joined Dr. Mary O'Riordan's lab since summer 2012 for research using the same Brucella model. Oliver He is Denise' PhD research co-mentor. Denise defended her PhD thesis on March 27, 2015. Omar Tibi: Volunteer research during April 2011 - May 2014 and since January 2017. Omar obtained his B.S. from East Michigan Universty, and studied in the Virginia Common Wealth University for two years, and then switched to the John Hopkins University M.S. Bioinformatics online program as a M.S. in bioinforamtics starting January 9, 2017. Since then Omar has resumed his bioinformatics research in the lab. Omar started to work for Sanofi in Boston on October 2018. Jiangan (Hardy) Xie （谢江安）: Hardy joined the He lab as a visiting PhD student on October 11, 2014. Hardy is a PhD student in the major of Computer Science from Chongqing University in China. He will stay in He lab for two full years for his PhD research. Hardy defended his PhD thesis soon after he returned back to China. In December 2016, he got an offer to join the School of Bio-information at the Chongqing University of Posts and Telecommunications (重庆邮电大学) as an assistant professor. Rebecca Leigh Racz, Research assistant (Summer 2012 - April 2016); Becca volunteered as an undergraduate student in the lab from Feb 2011-May 2012; Becca become a Pharmacy student during Fall 2012 and April 2016 in UM. After graduation, Becca became an ORISE fellow in FDA. Daniel Faghihnia, undergraduate student (UROP program Sept 2012 - May 2013; Credit course research Jan 2015 - April 2015; 2015 summer research assistant 2015). Dr. Haihe Wang (王海河), an associate professor from Department of Pathogenobiology, Daqing Branch of Harbin Medical University, Daqing, China, 163319. Dr. Wang arrived at Ann Arbor on 02/28/2017 to join He lab as a visiting scholar. He will return back to China on 3/1/2018. Dr. Hong Yu (余红), a professor from Guizhou University Medical School and a medical doctor from Guizhou Province People's Hospital, Guiyang, Guozhou, China. Dr. Yu arrived at Ann Arbor on 03/12/2017 to join He lab as a visiting scholar. She Ni returned back to China on 8/31/2017. Dr. Zhaohui Ni (倪朝辉), an associate professor from Department of Microbiology, School of Basic Medical Sciences, Jilin University, China. Dr. Ni arrived at Ann Arbor on 12/15/2015 and officially joined He lab early January 2016 as a visiting scholar. Dr. Ni returned back to China on 1/14/2017 (Saturday). 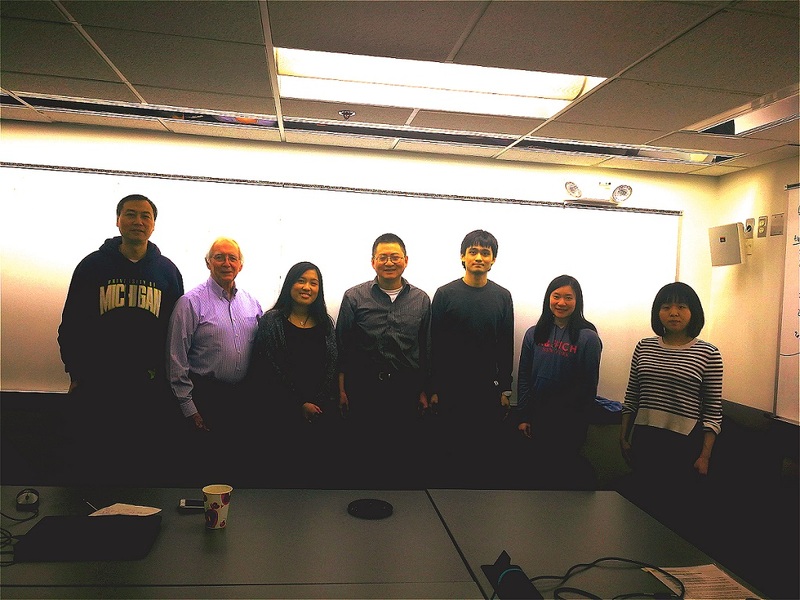 Dr. Qingping Liu (刘清平), an associate professor from the Guangzhou University of Chinese Medicine, arrived at Ann Arbor and joined He lab as a visiting scholar on 9/10/2015 (Thursday). Dr. Shunzhou Deng (邓舜洲): Dr. Deng joined the He lab as a visiting Scholar from May 27, 2014 to May 14, 2015. Dr. Deng is an associate professor (promoted to full professor in December 2014) of veterinary infectious diseases in Jiangxi Agricultural University, Nanchang, Jiangxi, China. He will conduct research in the He lab for one full year. Dr. Guanghua (Jeff) Hu （傅光华）: Jeff joined the He lab as a visiting Scholar for the period of August 23, 2014 to March 7, 2015. Dr. Fu is an associate researcher in the laboratory of avian diseases, Institute of Animal Husbandry and Veterinary Medicine, Fujian Academy of Agricultural Sciences, Fuzhou, Fujiang, China. Kimberly Berke, UROP undergraduate student (Sept 2013 - April 2015; volunteer aftwards), Kimberly joined the Central Michigan's College of Medicine in t he fall 2018. Bin Zhao, Bioinformatician. Bin joined He lab as a bioinformatics research internal as a MS student in UM School of Information (May 2013 to May 2014) and then as bioinformatician from May 20014 to 1/31/2015. Junping Yue: Part time software developer and system administrator (starting 2/24/2015 for one year). George W. Jourdian, Professor Emeritus of Internal Medicine and Professor Emeritus of Biological Chemistry, Medical School. Since Dr. He joined the UM, they had become very good friends, colleagues, and collaborars. The original He lab in the Kresge building was indeed part of Dr. Bill Jourdian's lab space before his retirement. Dr. Jourdian and Dr. He had been collaborating until 2015. They shared the same lab space, and Dr. Jourdian had helped Dr. He and He lab members with mentoring, lab skills, and discussions. Dr. Jourdian died on November 28, 2015. Arzucan Ozgur, Department of Computer Engineering, Bogazici University, Turkey. Junguk Hur, Dept. of Neurology, University of Michigan. Dragomir R. Radev, the Computational Linguistics And Information Retrieval research group, University of Michigan. Peter Woolf, Previously a faculty member in UM, now a founder and CEO of Foodwiki. Alfred Hero, Department of Electrical Engineering and Computer Science (EECS), University of Michigan. Zhaohui Steve Qin, Rollins School of Public Health, Emory University. Gary Huffnagle, Division of Pulmonary & Critical Care Medicine, University of Michigan Medical School. Jeffrey L. Curtis, Division of Pulmonary & Critical Care Medicine, University of Michigan Medical School. Michal Olszewski, Division of Pulmonary and Critical Care Medicine, Department of Internal Medicine University of Michigan Medical School & VA Medical Center Ann Arbor Research Service. Fan Meng, Department of Psychiatry, Molecular and Behavioral Neuroscience Institute, and Center for Computational Medicine and Bioinforamtics, University of Michigan Medical School. Note: We have been collaborating with many researchers and scientists on campus, in the USA, in China, and in many other countries around the world. The above list does not include all our collaborators (sorry).